Guarantee the performance of your thermal installation and optimize your energy consumption: calibration equipment and services. When used regularly, the accuracy of even the best measuring instruments deteriorates. To control the performance of measuring instruments and prevent any deterioration of quality, temperature calibration is essential. rawing on their thorough mastery of the temperature measurement chain, the Chauvin Arnoux Group companies Pyrocontrole and Manumesure propose a comprehensive set of temperature calibration solutions. Whatever the industrial sector, Pyrocontrole and Manumesure perform calibration of all brands of sensors and measuring equipment and also propose innovative, high-performance calibration equipment and systems in order to offer a complete service adapted to your needs. Whether you need working standards or reference standards, we possess high-performance equipment allowing us to manufacture specific temperature reference standards for calibration by comparison of your resistance sensors and thermocouples. Need advice? Our metrology specialists are there to guide you, step by step. 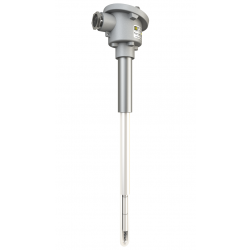 Used in workshops and laboratories, reference sensors allow first-level calibration. They must be recalibrated regularly against a reference standard. Used as reference standards in laboratories and metrology departments. • Certificate of calibration by comparison. Save energy: choose sensors with in-situ calibration! If you use sensors with in-situ calibration, it is possible to check the temperature without removing the sensor and without halting the process. The principle is simple: on the temperature assembly, a space is provided to insert a standard sensor for in-situ calibration by comparison. This helps to save energy while boosting productivity and quality. Patented method (patent no. 0213616) which can be used for all types of temperature measurement devices, whether they involve thermocouples or platinum resistance probes. This type of sensor is very widely ised in industrial furnaces and petrochemicals. - Calibration frequency as you require.